With the advent of digital age, a host of digital frauds have also come into play. Digital signatures are a step towards protecting yourself from document forgery and related frauds. But it does not stop there. Digital Signatures also offer a host of other benefits to its users. 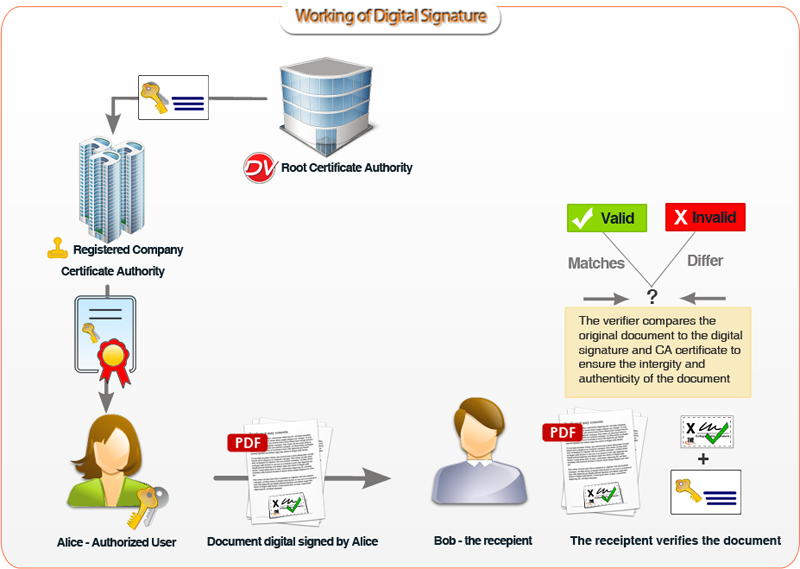 Digital Signature uses unique digital certificate issued to individuals for signing documents. Digital signatures are legally binding and are a preferred method of signing documents for compliance with various standards & regulations as they preserve the document’s integrity, verify the identity of the signer and provide for non-repudiation of signatures within and beyond your organization. Once a document has been digitally signed, any unauthorized changes to it would render the signature invalid. It also assures the recipients that the signed document is authentic and was indeed signed by its claimed signer. Docsvault Digital Signatures also enables your organization to create high-assurance business processes. Users can digitally sign PDF documents within the Docsvault system on demand, route digitally signed documents in a workflow for multiple approval signatures, auto-sign documents as part of a workflow and verify the validity of all signatures in a digitally signed PDF. Docsvault digital signatures are compliant with worldwide e-signature legislation like HIPAA, 21CFR part 11, US E-Sign law, EU law, SOX, GPEA, JITC and many more. Only allows the authorized user to sign ensuring quality and compliance with regulations. Once a document has been digitally signed, any changes to it would render the signature invalid. It is an electronic process that assures the recipient that the contents of a document have been created by a known sender and the document has not been altered after it was signed. This means peace of mind and assurance against tampering. Your business processes become more secure and speedier as you can now digitally sign legal documents, agreements, contracts, invoices and notices. Managers and higher level executives can easily approve periodic maintenance tasks, project budgets, quality docs, etc. in a workflow process without having to print a document and sign it. 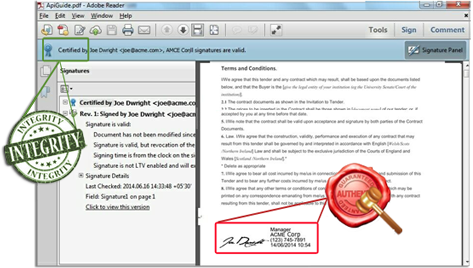 Computer-generated signatures can contain additional information for identity, purpose, etc. No need for any extra software or to mess around with digital key management. 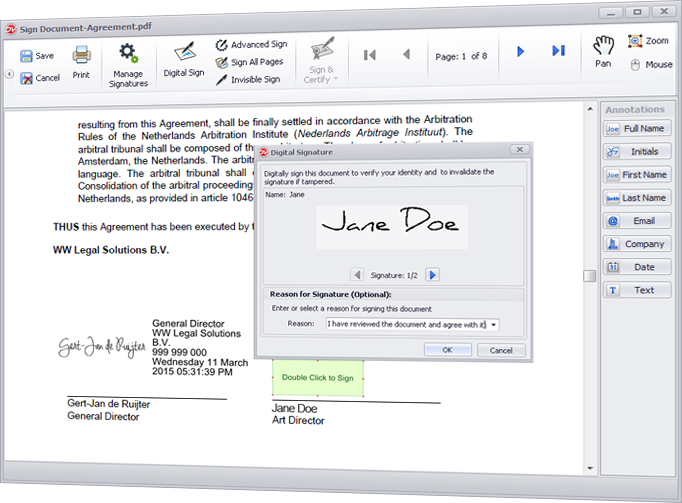 Digitally sign documents on desktop and on the web. Organizations interested in implementing a secure PDF Signing solution should look no further. 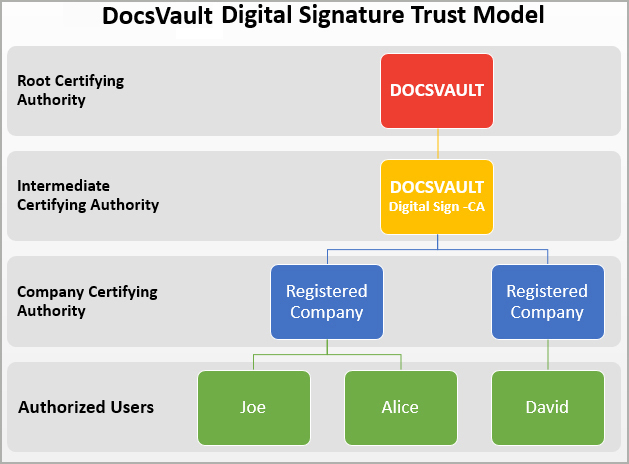 Contact us to learn how Docsvault can help you manage PDF Digital Signature Solution.